Monitoring shows the Campaspe River is gradually climbing back to health following the Millennium drought and the floods of 2011, which wiped out much of the river's plants. Environmental watering in summer and winter helped maintain habitat for fish, waterbugs, platypus and water rats, and continued the rehabilitation of aquatic and fringing plants. "Latest monitoring demonstrates the gradual return of aquatic and fringing vegetation in the Campaspe River since the 2013 survey," said North Central Catchment Management Authority's (CMA) Darren White. "The environmental water delivered to the river since the 2011 floods has likely helped this positive response." A small release of environmental water to the Coliban River in summer 2016 helped improve conditions for platypus. The release was made in line with scientific flow recommendations to maintain in-stream and bank plants, cue fish movement, mix water in the river and inundate snag habitat. The community has reported more frequent platypus sightings in the Campaspe River near Goornong following environmental watering. Rainbowfish numbers also continue to increase in the system. While environmental watering specifically aims to achieve environmental benefits, it also provides additional benefits for communities. 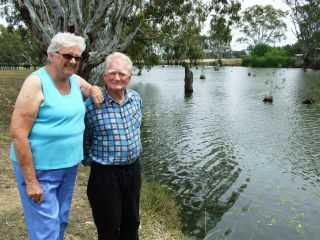 "Environmental water for the Campaspe River is held in Lake Eppalock. In 2015–16, there was an opportunity to adjust the magnitude and timing of environmental flows to coincide with deliveries to irrigators and other consumptive users," Darren said. "Those actions reduced the call on environmental water, which meant more water was held in Lake Eppalock where it helped support recreational activities like boating, fishing and camping." "More broadly, environmental watering provides greater recreational benefits for towns along the Campaspe. These activities can result in economic returns for the local community." Environmental watering in the Campaspe River made it an appealing camping spot, with campers venturing into Elmore and Rochester to buy groceries and lunch. Mount Gambier couple Ron and Andrea Disher were among hundreds of campers at Aysons Reserve (near Elmore) over the Melbourne Cup long weekend. "There have been a lot of people in here. A lot of kids jumping in the river, a few people with kayaks and rubber dinghies and there have been a few fishing," Andrea said. "I reckon over the weekend there were more than 100 vans here, and tents as well. This place and this river are really good."